I am a government employee. I don’t talk about it much because I don’t blog about work much. But it does impact this blog. Since I work for the Feds I cannot write about whatever I want on this blog. I give up a little of my freedom of speech in exchange for my paycheck. There is this thing called the Hatch Act that prevents me from writing about politics in a way that endorses particular candidates. This really is not a problem because I do not want to write about politics anyway. However, when I heard Donald Trumps remarks about not allowing Muslims in the country I felt sickened and angry. I am not a Muslim. I am a Christian. But I do not believe in condemning a whole group of people because of the actions of a minority of the group. No matter how disgraceful the actions. I also believe Trump’s plan is a slippery slope. Who’s next Jews, Catholics, etc??? 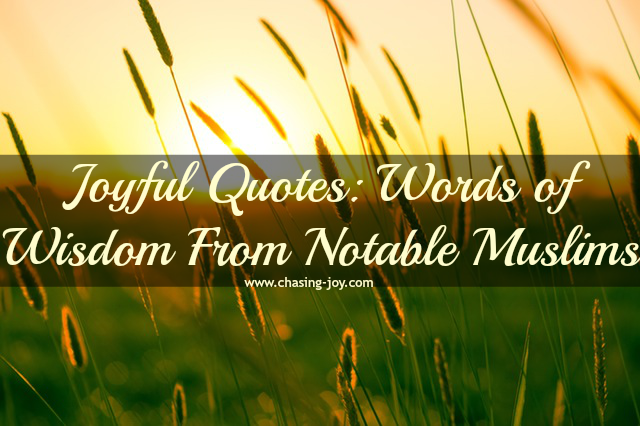 So given my feelings, my constraints, and the theme of this blog I felt the best way use Chasing Joy today was by sharing some joyful quotes, words of wisdom, from Muslims. Not one faith has a monopoly on words of wisdom. Don’t you love a good quote? These are such great quotes! I try to surround myself with quotes that encourage me to be the best version of myself that I can be! What a positive way to deal with all of the negativity! Thanks for sharing these quotes! Those are great quotes. I love having quotes on hand for the days I need motivation or encouragement. These are some useful and fun colloquialisms. Those are all great quotes. I have quite a few favourites from those. Discrimination is always a step in the wrong direction. These are some really good quotes! I appreciate your way to express your thoughts within the constraints of the job you've chosen. Focusing on positive thoughts is always more beneficial! I never thought about having a government job and not being able to say what you want. You handled your words of wisdom wonderfully. These are wonderful, and they couldn't come at a better time. I see far too many people confusing Muslims with terrorists. Thanks so much for sharing these! There's way too much anti-muslim everything going on right now. I love a good quote. Wisdom comes from all people. Thanks for sharing these quotes. I bet many will be surprised to find the quoters Muslim.